During the late innings of the ICE-age (as in the Internal Combustion Engine age), it has become clear that feeding gasoline and diesel to the next billion new cars is not going to be easy, or cheap. In China alone, 500 million new vehicles expect to jam the roads between now and 2030. That may sound far-fetched but considering annual sales have already made it to 25 million units per year (vs. around 17 million in the U.S. – China became the top market in 2009), it only requires a 4 percent growth rate to reach that target in fifteen years. The cost to operate an EV, per mile, is already well below the cost to drive a standard ICE-age model, and the advantage is likely to widen. The average U.S. residential customer pays 12 cents per kilowatt-hour (kWh), which means the cost to drive one mile in an EV is somewhat less than 4 cents. By contrast, at 25 miles per $3 gallon of gasoline, those miles cost 12 cents each. Coal still supplies more power in the U.S. than anything else, with natural gas next. However, building more coal and gas power plants to make miles for transport is counter-productive if the game plan is to reduce carbon output. Even though not all renewables are created equal, power purchase agreements (PPAs) for PV projects with utilities in the U.S. Southwest are now coming in under seven cents per kWh for a twenty-year period. At that rate, the cost to operate an electric vehicle is 2 cents per mile. Hydropower in Seattle will push you around for the same price. The first ‘eye-opener’ for large scale solar was the Austin Energy PPA last year that priced at 5 cents. What this country needed was a good 5-cent kWh, and now we have it. An acre of corn that provides 500 gallons of ethanol, at 22 mpg, gives you 11,000 miles, or it would if such gallons had the same energy content as a gallon of gasoline. However, suppose your new car is up to current Chinese standards (~35 mpg). In that case, Iowa’s acres provide 12,500 miles in a year (17,500/1.4). This is still roughly two orders of magnitude less output per acre than Warren Buffett’s Agua Caliente array in Arizona. 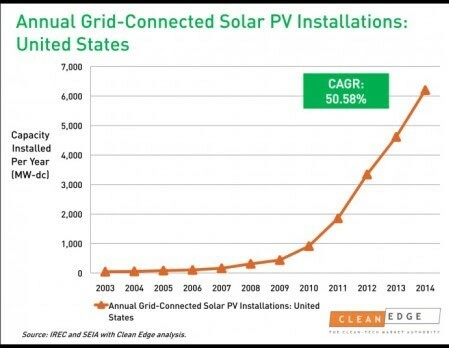 No wonder Berkshire Hathaway has already bet a billion on PV arrays. One could say that Mr. Buffett has not only seen the light but also invested heavily therein. An acre of desert in Arizona, Nevada and many other places on earth ‘sees’ on the order of 3,000 hours of direct sun per year. (This amounts to 34 percent of the total 8,765 hours available, half being dark.) PV arrays on a house are spaced closely together and it is reasonable to figure 250 kilowatts (kW) per acre of aggregated rooftops. However, it costs more to build an acre of rooftop PV. On the ground, the figure is closer to 150 kW per acre. The biggest difference between rooftop and most of the utility scale arrays yet to be built is that it makes sense, when possible, to track the sun. Since not everyone can afford to build houses that track the sun, let us just assume that all residential rooftop arrays will be fixed. In the commercial sector, and in the case of community solar, there is more flexibility and tracking arrays may make sense, especially when mounted on the ground. The arithmetic is pretty simple. You get about 20 percent more yield by tracking the sun. A rooftop array is pointed directly at the sun (known as direct normal irradiance) only for a short while each day, assuming the roof pitch is right, and most are not. If it costs 10 percent more to get that 20 percent extra yield, do it. An acre of desert PV will easily yield 300,000 kWh (150 kW per acre x 2,000 hours of direct normal sun) and a million miles per year for an EV. Since 2,500 to 3,000 hours are available in many places, the figure jumps to between 375,000 and 450,000 kWh per year, yielding between 1.25 million and 1.5 million miles per acre per year. In other words, the output from (more expensive) ethanol is little more than a rounding error compared to the output from PV. The choice is between a million miles per acre per year, costing 2 to 4 cents each from the sun, or 10,000 miles per year costing 12 to 20 cents from a cornfield better served making food. Even if the figures were supportive of the ethanol case, biomass in general does not scale very well. 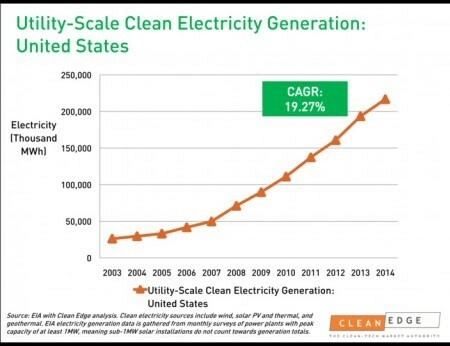 Silicon based PV, on the other hand, is hugely scalable and relatively cheap. It really is not a fair fight. The calculation for rooftop solar is not quite as straightforward as multiplying the number of kilowatts by the number of hours of sun in a year. NREL has done the math on how many kWh you get from a fixed (non-tracking) array per day from a square meter depending upon location. The number of kWh is roughly how many hours per day the panels will produce peak power. The US average is around four hours which means that, for an individual homeowner, a 3-kW PV system in a less than arid region will still yield 4,000 kWh (3 kW x 4 hours x 365 days) and enough EV miles to cover the average annual 12,000 – 15,000 miles of commuting. Even at 15 cents per solar kWh (and, as mentioned, many PPAs are coming in at half that figure or less), you will save about 10 cents per mile over the gasoline price. The 5-year fuel savings will pay for a 3-kW system. Chevron, ExxonMobil and Shell cannot stop this; they will begin to bleed trillions of miles per year. They had better think seriously about financing solar and wind arrays. 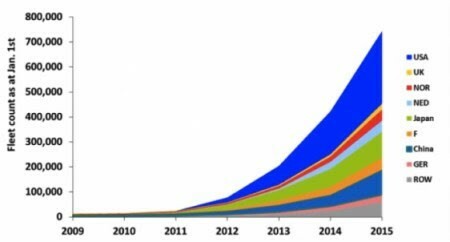 The estimated one million EVs on world roads by the end of this year will cover roughly 10 billion miles per year, and over 100 million miles over their lifetime. What will ExxonMobil’s share price be when cumulative EV sales reach 100 million units? By 2030, millions of people will have transport fuel that is ‘on the house.’ During the midday hours, many grids will experience negative pricing as solar PV floods the market to the extent that the power cannot be stored. As millions of EVs hit the road, four percent of the time, on average (the rest of the time they are in a garage or parked on the street), they will likely become the default destination for stored electricity. When there are 100 million EVs, figuring 60 kWh batteries, the fleet will provide 6 terawatt-hours of storage, enough to run the U.S. (with 1,000 GW, or 1 Terawatt, of power capacity) at peak power for six hours, or the world (with 5 Terawatts of capacity ) for over an hour. If all the cars sold in the U.S. this year were electric, their battery capacity would be sufficient to power the country for an hour (17 million vehicles x 60 kWh). How many gigafactories will Mr. Musk have to build?